Road traffic could be allowed to travel along railway tracks to avoid an area where landslides have closed a road for more than two weeks. Highland Council said it was an option being considered for the section of A890 Lochcarron to Kyle road. 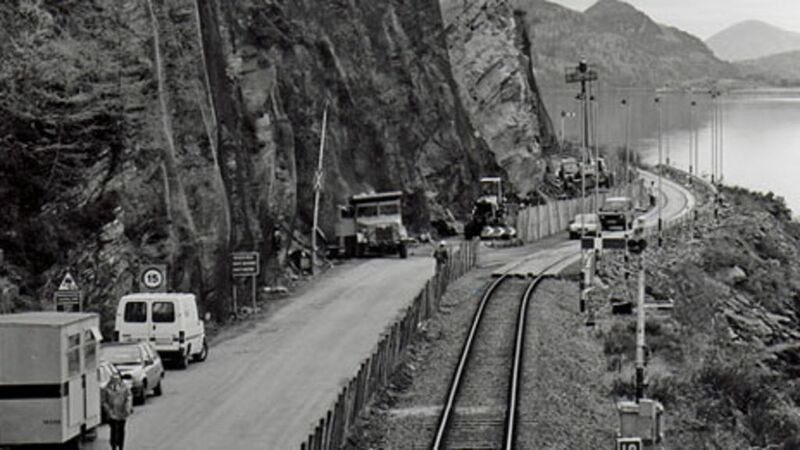 In October 1990, traffic was allowed onto the nearby railway line after rockfalls in the same area. The method uses railway sleepers and would end the need for motorists to make a 140 mile (225km) diversion. Network Rail said it was looking at the possibility of allowing traffic onto the line again. Road traffic could be allowed to travel along railway tracks to avoid an area where landslides have closed a road for weeks. Rock falls are an ever present hazard on parts of the Kyle line. Along the shore of Loch Carron, between Attadale and Ardnarff, a particularly bad fall on 16 November 1969 resulted in closure of the line for almost 4 months. It was as a result of this incident that an avalanche shelter was constructed which now protects both the railway and the road here [see image 33349]. Note the steel netting which is used extensively on rock faces along stretches of the line. Scene on 29 September 2009, with a car about to enter the shelter heading west towards Stromeferry. View west over the new alignment of the railway to the east of Stromeferry station in February 2002, just prior to tracklaying in the aftermath of the mudslide. The original course was very slightly closer to the hillside.